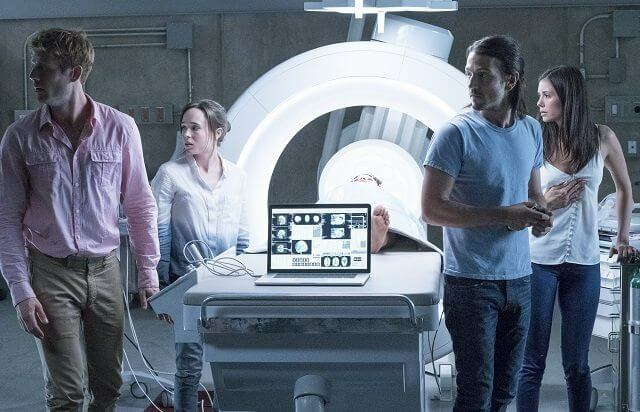 Columbia Pictures’ Flatliners remake has unveiled its first official trailer. Niels Arden Oplev (The Girl with the Dragon Tattoo) directed the 2017 version of the 1990 film which starred Kiefer Sutherland, Julia Roberts, and Kevin Bacon. The cast of the remake includes Ellen Page (X-Men: Days of Future Past), Diego Luna (Rogue One), Nina Dobrev (The Vampire Diaries), James Norton (Happy Valley), and Kiersey Clemons (Transparent). Ben Ripley wrote the screenplay and Laurence Mark, Michael Douglas, and Peter Safran produced Flatliners. Columbia Pictures has set a September 29, 2017 theatrical release date for the sci-fi thriller. The Plot: In Flatliners, five medical students, obsessed by the mystery of what lies beyond the confines of life, embark on a daring and dangerous experiment: by stopping their hearts for short periods of time, each triggers a near-death experience – giving them a firsthand account of the afterlife. But as their experiments become increasingly dangerous, they are each haunted by the sins of their pasts, brought on by the paranormal consequences of trespassing to the other side.